Propane wall heaters are the ideal space-saving heating devices that produce high heat and are relatively efficient. From safety features to operational controls, propane wall heaters vary in what they have to offer so understanding which heater is right for you will determine how well it performs. Whether you’re looking for vent-free or vented options, this guide will help you decide what you need in your home. One of the first things to consider when choosing a wall-mounted propane heater is whether you want a heater that vents to the outside of your house or one that operates without a vent. Most commonly you will find that propane wall heaters tend to be vented. It means that they vent the gases from the heater to the outside of the house, usually through a vent pipe. 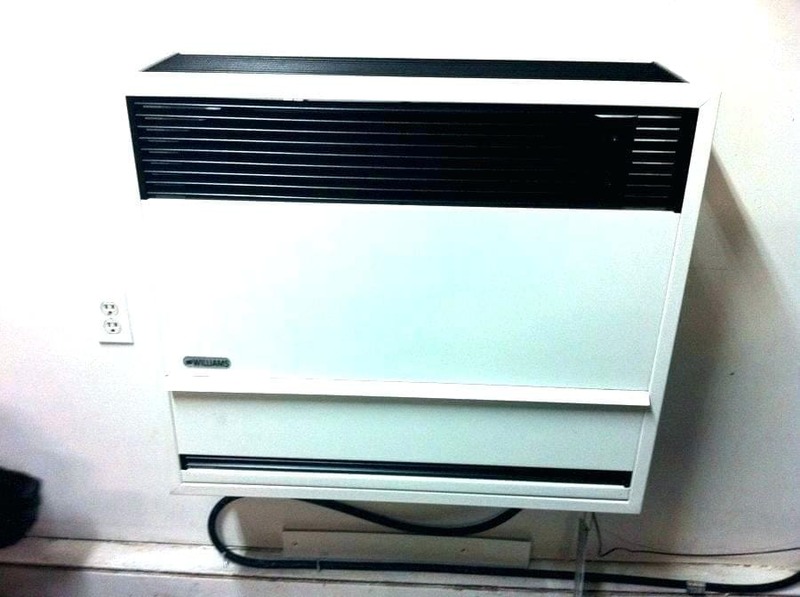 This vent pipe is attached both to the heater and to your home and goes through the wall on which the heater is mounted. It prevents any noxious gases from entering your home, therefore being healthier. However, the problem with vented propane heaters is that they lose heat through the ventilation, making them less efficient than those without vents. The loss of efficiency means you will need to burn more fuel which is less eco-friendly and costs more. Moreover, the installation requires a lot more effort, especially if you don’t already have a hole for the ventilation pipe to be fed through. You will need a professional to install the heater, which also raises the costs. Ventless heaters are far easier to install and are more efficient. However, the lack of vent to the outside means that these types of propane wall heaters vent the gases into the room in which the heater is installed. However, the higher burn efficiency reduces considerably the chances of harmful gases entering the household. First and foremost, you need a heater with the capacity to heat the space you choose. With propane wall heaters, you need to look at the BTUs (British Thermal Units) to determine if the heater has enough power to warm a room properly. As a rule of thumb, you need around 40 BTUs per square foot. Consider how the heater ignites. Some heaters come with automatic ignition as soon as the heater is turned on, which is a very effective tool and extremely easy-to-use. Other models will come with manual ways of igniting. While it may seem less convenient, ignitions tend to wear out over time, and therefore those that can't be ignited manually become useless. You need to think about where you will be putting your heater as it will lead to certain choices you make. For example, if you already have a ventilation pipe in your living room, vented options are the most sensible. However, if you don't, and if there is no external wall, you will need to consider a ventless option. Moreover, if you are choosing a heater for the exterior of your home, you need to look for outdoor propane heaters. In the same breath, outdoor heaters should never be used inside. Safety features are also important, especially if you have small children or animals. Overheat protection helps to cut off the heater if it starts to get too hot, preventing a fire. Some propane heaters will have cool-to-touch exteriors that prevent burns if touched. Moreover, look for one with a safety guard to decrease the chance of getting burned. Think about your budget. While there are cheaper options for propane heaters, they usually sacrifice safety features and tend to be less efficient. Regarding this, consider the cost and look for the best option in your price category, always remembering the additional cost of propane. Selecting the right location for your propane wall heater is important so that it works effectively and safely. The first thing to think about is whether your propane wall heater is vented or ventless. Vented heaters are more limited about where they can be placed as there is the need to access an external wall so that the vent pipe can be run outside. With both options, however, the propane tank needs to be set outside. With this in mind, you will want to mount your heater as close to the tank as possible, to make it easier to run the piping. That is why, most people will choose to have ventless wall heaters placed on an external wall as well, simply for ease of process. Generally, it is better to place your heater low down as heat rises. It will ensure a more consistent temperature as warmth is able to spread more evenly throughout the room. Propane heaters can be extremely dangerous as gas is highly flammable. It is important to consider the safety features, especially if you have children and pets. On a basic level, you need to look at propane wall heaters that have a safety guard on the front to reduce the chance of burning yourself. Looking for a heater with a cool-to-touch guard increases the safety level. You can also source propane wall heaters that have cool-to-touch casing as well, which means that the whole heater stays cool despite radiating heat outward. Secondly, look for a propane heater with overheat protection. When propane heaters get too hot, they run the risk of setting on fire. Overheat protection shuts off the heater if it reaches a certain temperature or if the components get too hot. Efficient propane burners produce carbon dioxide. However, if the oxygen levels drop or the combustion level lowers, the propane can produce carbon monoxide. It is a toxic gas that is colorless and odorless, posing a huge risk to your health. Some wall propane heaters include a low-oxygen shut-off. It turns the heater off if the oxygen levels get too low or if combustion isn’t happening to the fullest. Try to look out for safety certifications to verify the safety levels of the heater. Propane wall heaters that are certified by CSA meet all the safety standards necessary for a propane heater to be at a house. With the ability to heat 750 square feet, this supplemental heater works by convection. It is CSA certified and includes a low-oxygen shut-off mechanism. With legs for floor installation and all wall mounting components, this vent-free heater has a thermostat for consistent heating options. It has an electronic ignition making it easier to start up. The legs and wall mounting equipment make this a versatile heater. It works well at higher elevations which is unusual for propane-powered heaters that usually shut off at high altitudes. The oxygen depletion sensor helps to prevent the production of carbon monoxide, increasing the safety of this heater. It doesn’t have a blower included, meaning it takes a little longer to heat the room. The fittings that are supplied aren’t entirely suitable for the most effective installation. 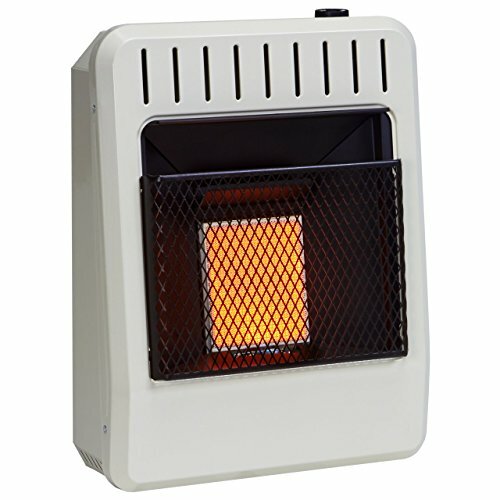 It is a great model for supplemental heating, with good safety features and easy to operate. The fittings are low quality, and the lack of blower makes it a while to heat a whole room evenly. Using infrared technology to radiate the heat, this vent-free heater can warm up to 300 square feet of space. The heat can be manually adjusted, and an oxygen depletion sensor prevents carbon monoxide from forming. It is very easy-to-install and simple to operate. It has an low-oxygen shut-off increasing its safety. It has a battery assisted ignitor which makes it easy to ignite. This heater produces a surprising amount of heat for such a small device. This heater burns with 99.9% efficiency, which lowers propane bills as well as preventing carbon monoxide from forming. There is no blower included with this model. There is no thermostat included and all controls are manual. Despite the lack of blower, the infrared technology makes this small heater a powerful heating device. With added safety features and high efficiency, it is a good choice for those who don’t mind manual controls. 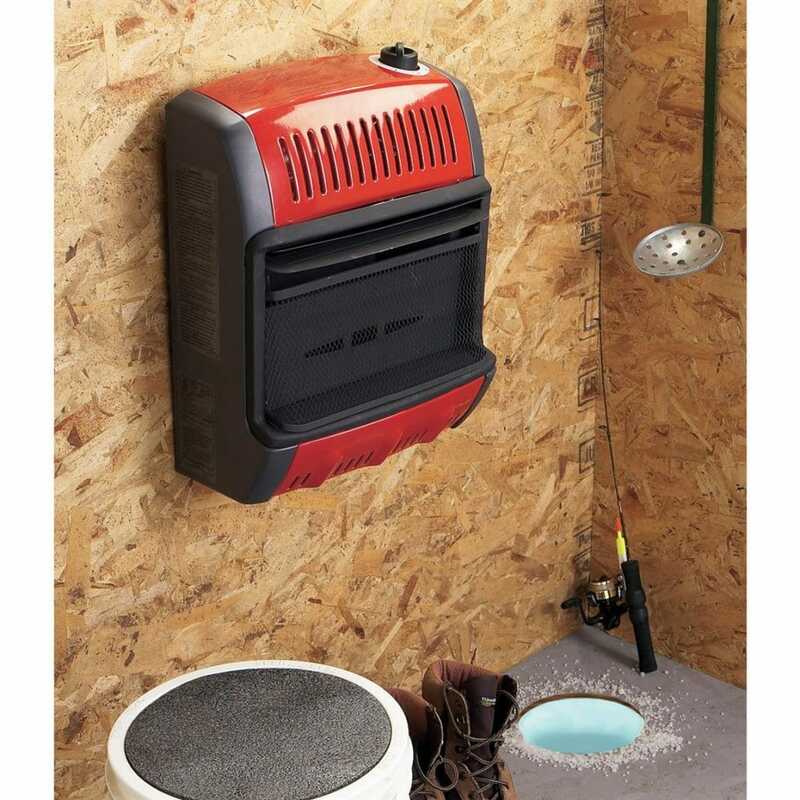 This vent-free radiant propane heater can warm up to 750 square feet of space. It has legs and wall mounts, as well as an adjustable thermostat. It is CSA certified and has an automatic oxygen depletion shut-off. It is straightforward to use and easy-to-install. It has a blower to dissipate the heat more evenly around the room. It has versatile mounting capabilities and can be used on the floor or in the wall. The infrared technology directly heats objects, making it a powerful heater that works very quickly. The fittings that come with the heater are low quality. The carbon monoxide sensor is very sensitive, which means it shuts off quite easily. 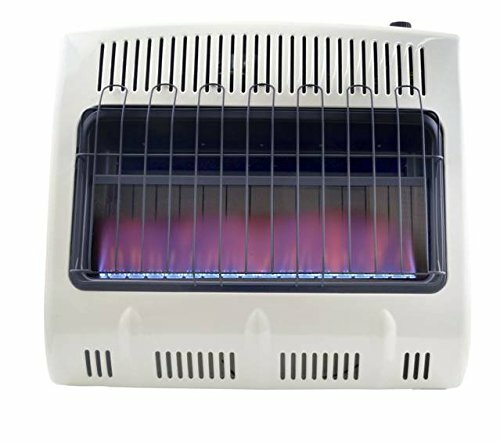 It is a good heater that kicks out a lot of heat and has an adjustable thermostat for ease of use. The fittings are low quality, and therefore you need to purchase your own fittings to make sure it is secure. Designed to heat 500 square feet, this vent-free heater is CSA certified and comes with low-oxygen shut-off. Suitable to be mounted on the wall or floor, it includes all fittings and legs. 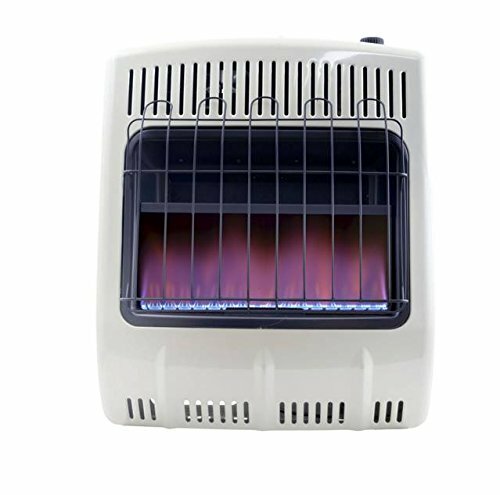 The blue flame technology works as a convection heater, and electronic ignition is included. It is quite powerful and heats a room easily. The electronic ignition makes it easy to get the heater started. There is a built-in oxygen depletion sensor to keep you safe from carbon monoxide. This model includes a fan to help blow the heat evenly around the room, which speeds up the heating process. The fittings are of poor quality and break quite easily. It makes a loud popping noise that can be a little interruptive to the peace of the room. Apart from being a little loud, this heater works very well and gives a high, even temperature. It has good safety mechanisms and is easy to start. Be careful when installing, as the fittings are a little fragile. 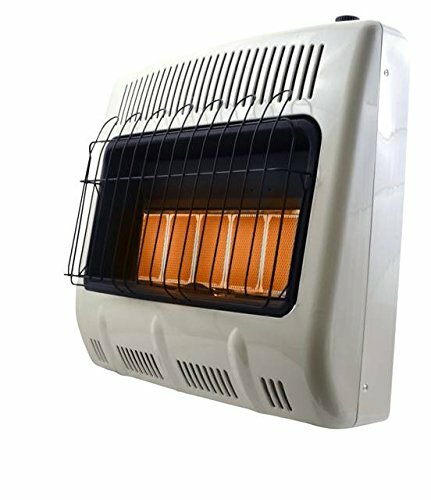 This is a dual fuel vent-free infrared heater that can be used with either propane or natural gas. It uses ceramic plates to reflect heat more effectively. It has 5 heat settings and a thermostat. The 5 heat settings make it suitable for all different weathers. It can be used with either natural gas or propane for more versatility. The ceramic plates reflect the heat very effectively, heating the room quickly. The thermostat is very accurate and keeps the room at a constant temperature. It doesn’t include a fan or fittings to install one. It makes a popping sound when the thermostat kicks in and turns off. 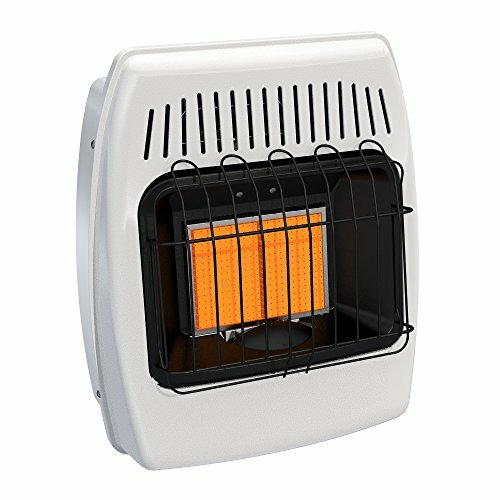 This heater is versatile and can be used to heat small spaces well. It has a good thermostat and has adjustable heat settings, but doesn’t include a fan. Choosing a propane wall heater is a good to supplemental heating and can be very effective, especially in smaller spaces. Make sure to consider the safety elements as propane can be dangerous if carbon monoxide levels are not monitored. If you are looking for easy installation, try a vent-free propane wall heater, and always remember to choose the right heater for the size of your room to maximize efficiency.